But more than anything, of course, I remember the noise and the swelling of cheers and shouts and palpable love and emotion raining down on the field. I remember Mike lingering for what seemed like a very, very long time, waving and acknowledging the crowd. I was so happy that I was there and I was so happy that I understood it, even if I hadn’t been there for most of it. All that mattered was that I was there now. I brought my crappy point and shoot camera and took crappy photos, because I wanted to capture a little bit of that day. And now, here we are, eight years later, and I am watching Mike Piazza get inducted into the Mets Hall of Fame. I have lived through playoffs and frigid April games. I saw Endy’s catch; I was there for Johan’s no-hitter, and countless smaller achievements in between. I have been to 24 of 30 ballparks. I survived the transition from Shea to Citi only to abandon my ticket plan. I went from 40 games a year to an all-time low of 2. The little blog I wrote for my friends became a website of some note. I ruminate on all of this while sitting in the Citi Field press box, sitting on my hands during Piazza’s Mets Hall of Fame induction ceremony. I knew I couldn’t applaud, but there was nothing preventing me from smiling as big as the outfield the entire time. 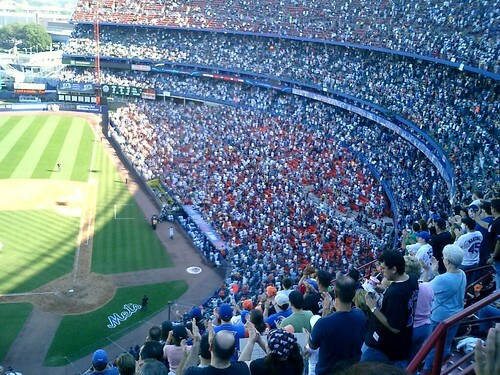 After the debacle that was the “Goodbye To Shea” ceremony in 2008 the Mets have, admittedly, learned more than a few lessons. The ceremony is distinguished, respectful, correct, full of history and recognition. Howie Rose as MC keeps it down home, or at least as down home as we get here in Queens. A full complement of former teammates is present. There is a montage of stats achieved, milestones hit or broken, and key moments. But the most important thing, at least to me, was the fact that the Mets AV team played “Voodoo Chile” as Piazza walked out of the dugout and onto the field, and segued that into “Stranglehold.” These were Mikey songs, these are big, badass rock and roll anthems. They said a lot. Having them part of the ceremony today was a very nice touch. We have come a long, long way since the opening year of this joint, completely bereft of any hint of a past. In the press conference before the ceremony (which was as close of a rock star moment as I have had in baseball, which I guess is only appropriate), Piazza was asked a lot of questions, most of which you could probably guess and also provide the answer to. The answer I appreciated the most was the response to what Piazza considered his “Mets moment,” and instead of going with 9/21/01 or anything else that you might expect, he went with the last day in 2005–”the love that was shown from the fans”–and his first game back in 2006 with San Diego, and how he was cheered, even when he hit two home runs (“I don’t know if the third would’ve gotten cheers,” he did note, and I think he was right on there). Stupidly, selfishly, my first reaction was: I was there. Both of those times. I was there. But that is part of loving baseball, being there for those moments, being able to say you were there. And, of course, this is why I made sure I would be here today, and why I will be going to Cooperstown when Mike Piazza finally makes it in. I barely felt baseball this year, with another crazed summer of covering the Bruce Springsteen tour in Europe. So I was happy to be here, I was happy to be back, I was happy to be able to watch live Mets baseball again. I am trying to be optimistic for 2014; the first quote that springs to mind is, “I WANT TO BELIEVE.” It would be great if the front office could give us something to grab onto this winter. To quote Terry Collins from the manager’s press conference this morning, “The talk’s pretty much over now; time to put it on the field.” No matter what, I am ready to come back to baseball again, even if we stumble through another season with not much to show for it. My next novel, A Brand New Ballgame, will be out in January 2014. You can sign up here if you’d like to know when it’s published.